Benjamin Franklin said that in this world there is nothing certain except death and taxes, but I would add one more thing to that… death, taxes AND the palms of your hockey gloves rotting out. It will always happen and when it does there’s not a lot you can do except buy new gloves. My summer hockey season has started (I don’t usually play summer hockey, but when I do, I try to make sure it’s in the summer) and while checking my equipment before game time, sure enough, I discovered the palms of my gloves were all but gone. There is another old saying… necessity is the mother of invention… and it just so happens that I ran over a pair of leather work gloves with my riding mower (it’s been an eventful week for me) so in a desperate attempt NOT to buy new hockey gloves, I grabbed a needle and thread and re-palmed my hockey gloves with the chewed up work glove. Love it! 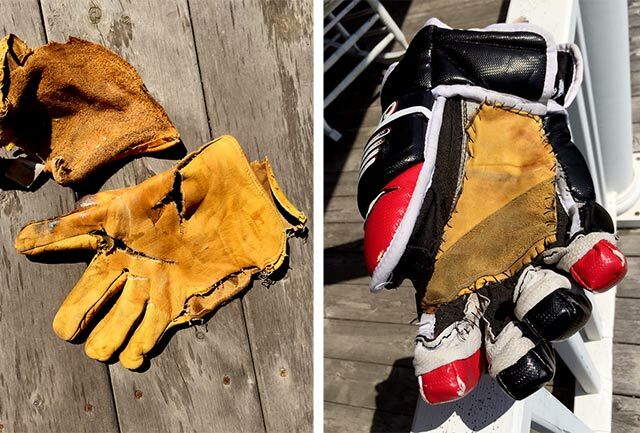 Maybe I can save an old pair of my gloves that way.